Universal Compatibility - Support most Android tablets, Windows phones and cell phones with a Micro-USB port. Compatible with Samsung Note 1/2/4/5, Galaxy S3/S4/S6 Edge S7, Nokia Lumia,HTC ONE and others. It fits in almost every case. 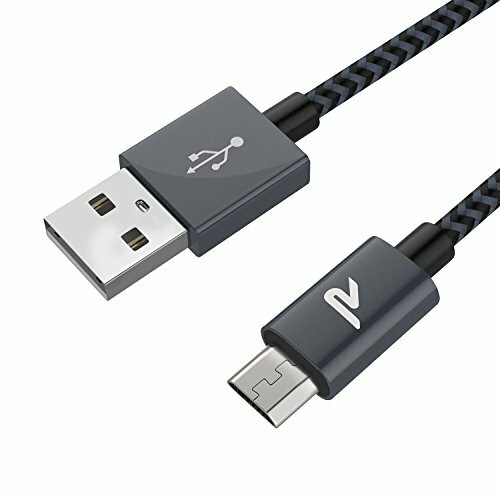 Fast Charge & Sync- Ensures a maximum charging speed up to 2.4A, charges faster than most standard cables, and works better for tablets and quick charge devices. Transfers data up to 480 Mbits through wide diameter 28/21 AWG data and power wires. Extra Long - The 6.5ft/2m cable is convenient to use while in bed, a car, or office. No worry again for the short length of cables. Lifetime Warranty - Rampow® Unconditional Lifetime Warranty, ensures long-time enjoyment of your purchase. Please contact us with any question or concern - we are here to help.